From the team that put The Wonderbread Factory on the cultural map, comes a new neighborhood experience: North Capitol Main Street. Live Performances, Graffiti Art, Video Screenings, Whimsical Creations, Live Painting, Bodyart and light happenings transform three massive outdoor spaces into the ultimate mash-up of cultural and urban arts experience. Get ready for a night to remember! With three incredible spaces, there’s something for everyone and more than enough to keep you entertained throughout the Art All Night: Nuit Blanche DC at the North Capitol on Saturday, September 27, 2014. It’s free-just register on Eventbrite: http://artallnightnorthcapitol.eventbrite.com. Join a visual and musical journey through a spectacular Winter Wonderland. Venture into fairy-tale land, walk the snow-lined path and step into to the kingdom of Ice Queen. She is the Ice Queen: cold, reserved, and giving nothing away. She masks her soft heart behind a wall of ice. But will the beauty of art bring life to her world of ice? See for yourself, as artists of different genres use their talent to melt a heart of ICE QUEEN during this unique theatrical and musical art show. Set in an atmosphere of an enchanted winter forest with snow-topped trees, twinkling lights and fairy-tale creatures, this year’s event will leave you in awe! But you must be there to experience it all. For tickets go to http://www.ticketmaster.com/event/15004B4EE5038415. Art Soiree Productions, AFDC, Eighty Eight DC, SPAIN arts & culture, Art All Night and Cultural Tourism DC are partnering up again to bring a true Nuit Blanche experience to the all new and renovated, postindustrial Wonder Bread Factory as part of the Art All Night DC 2013 festival! 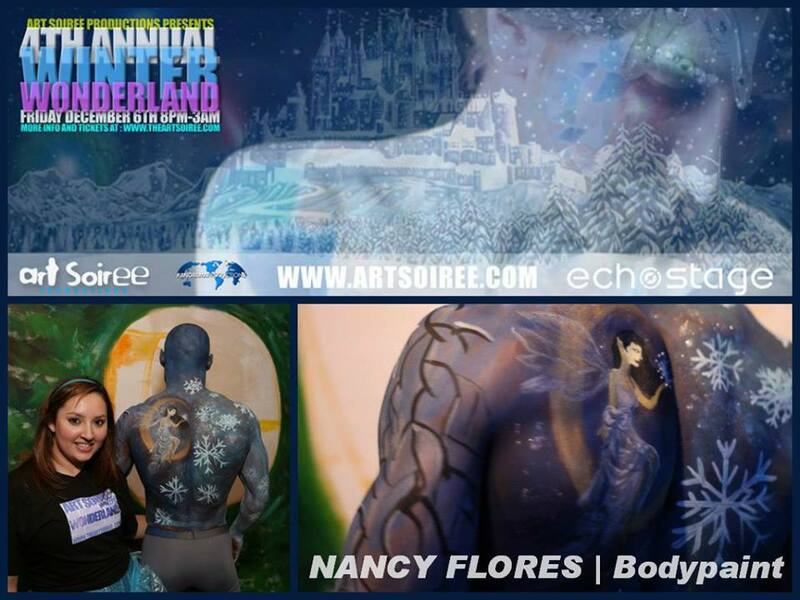 Come see me live-paint a mural as well as bring to life art in using body art on a model. Tickets are free but you must register! For tickets on eventbrite go to http://www.wonderbread.eventbrite.com. Artomatic is back!! This time, it’s in the lovely historic part of Frederick, Maryland. Come check out me and about 350 other artists as we hold an exhibition at 115 and 117 East Church Street. Artomatic runs September 4 thru October 5th 2013. To check out upcoming events, visit their Homepage at http://www.artomaticfrederick.org/. Come join us for a fun filled night under the stars, with great music, people and art! I will be live-painting on the rooftop of the Beacon Hotel in Dupont August 10, 2013 from 7pm-12am. It’s a free event but you still need to register for tickets, please click here to register on eventbrite. I am also painting on August 17, 2013 from 7pm-12am. Ooh La La! Mesdames et Messiuers! 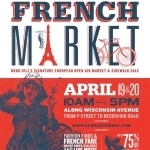 I have an upcoming event that is part of Georgetown’s French Market this Saturday April 20th from 11am-5pm in the TD Bank Parking lot. This event is different than the previous Art Soiree events because it’s not just art! 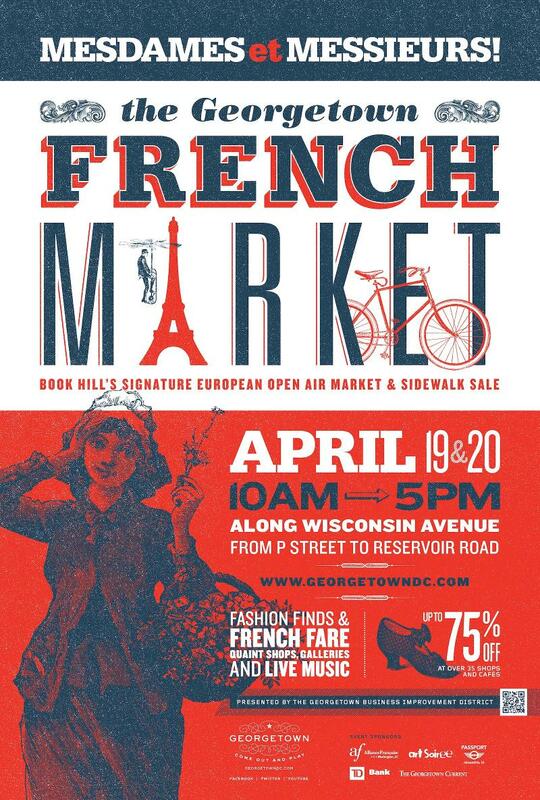 The charming Book Hill neighborhood of Georgetown transforms into a Parisian open-air market during the 10th Annual Georgetown French Market. So come if you’re free, bring friends and enjoy this cute little Parisian Market and enjoy the Spring while watching a little bit of art! I’m ecstatic to announce that I will be exhibiting at my first non-local art show in NYC at The Prince George Ballroom May 11-12th.The venue is such a gorgeous backdrop for the Parallax ‘Art’ Fair. 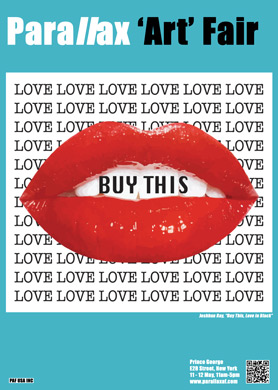 For more information about the 2013 Parallax Art Fair May 11-12th: http://www.parallaxaf.com. 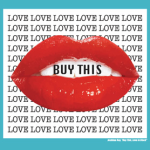 Come take a look at our contradictions to commercial art.